If you have a French press coffee maker, you either have a cozy or know the sadness of a tepid second cup. After a little experimentation and input from a friend with cold coffee, I’ve come up with one that makes me happy. These cozies won’t get coffee drips all down their fronts, like the velcro-on style I already had, and can be placed on the press before the pot is plunged, helping to keep the coffee that much hotter. 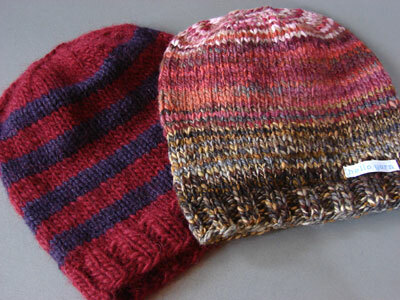 The pattern takes about 90 yards of bulky weight yarn and is a great way to use up leftovers. PS: I think this is the first time I’ve remembered to use my little labels. Aren’t they cute? You are awesome. Yay french press cozy! i love the labels. and i think the cozy makes a nice hat. Your labels are great! I hate it when my coffee gets cold, therefore my press goes unused most of the time. I think I’ll dig it out from the back of the cabinet! Wonderful! 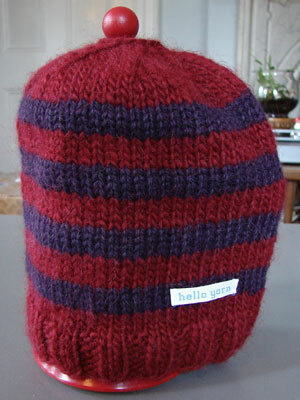 Adrian, how funny, do you know that a french press cosy is one of our book patterns? It’s really different, but designed for the exact same reason–that tepid second cup. Cute! Love the label and how the cozy looks in handspun. Your pattern looks fabulous! Figuring out a cosy for my french press has been on my to do list for ages. Great — now I’ve got yet ANOTHER project to do….I love the fp but hate the speed with which it cools; this is perfect! And, the labels are wonderful…. 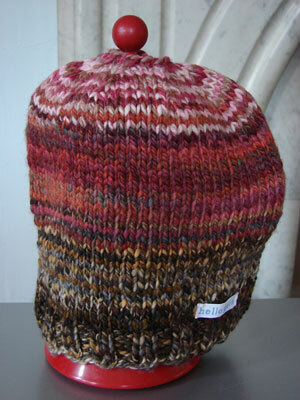 hats for giants… I love the handspun- such lovely color combo. Ok. So this has nothing to do with this particular pattern. I can’t help it! I just found this blog, saw the chipmunk/oak mittens and insect sweater and had to post. Do you make patterns for people? I want a pattern for a Norwegian Elkhound (it’s a dog! )design I can use on mittens. Any interest? Sally R.
Is that a red bodum french press? I have a similar looking one (at least the tippy top and very bottom) that I got when I worked at Crate and Barrel ages ago. Looks great your your cozies and fun hello yarn labels! the second cup has always been a bummer. Those are the cutest little labels! Great idea, the hotter the better when it comes to coffee! That’s right ! Why should tea pots have all the fun? Right on! i love the french press. i’ve been meaning to get another to replace the one that i broke while moving here from l.a.
because i like my java like lava, that whole warmish-2nd-cup thing was the only problem i had with french press coffee-making. the cozy is a brilliant idea! Well, so much for what I was knitting. Must… cast on… right away! My french press is so good to me, it deserves this cuteness. Thank you! That’s great! I’m going to make one. Your labels are too cute! I have a 2-cup French press, so I’ll have to scale down a bit, but this is a great idea. Lord knows I know the sadness of a tepid second cup! That is so cool! I have a foodie friend who uses a French coffee press and this would be a great gift for him. I may have to go out and knit one for him. What a great idea! It was the perfect pattern for me to tackle last night. Thanks for such a quick, clever pattern! Thanks, Adrian! I think it’ll work for my stove-top espresso maker, too. At least we’ll all be well-caffeinated….